I would like a link in each of my organic groups where Forena would replicate some of my views and create a pdf document with a page per OG user. I've looked through the documentation and module but my SQL knowledge is quite primitive and I don't see anything related to using the current NID in queries. 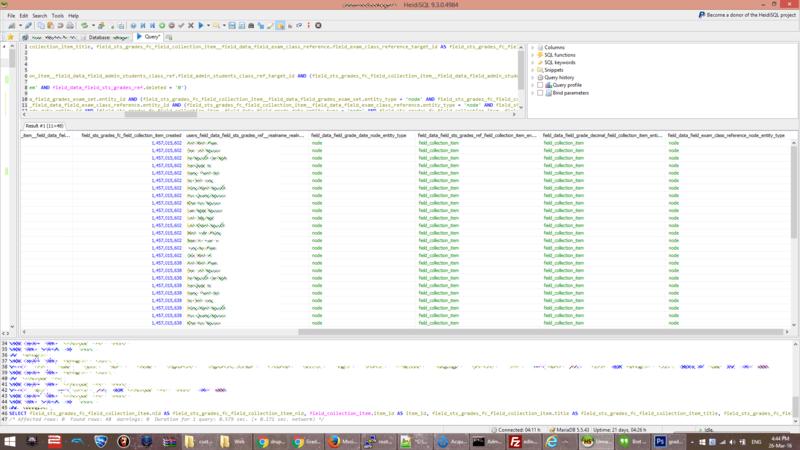 I think the Views Show Query module would allow me to copy the relevant queries into Forena while I learn the SQL. So my question is, does the above sound possible and would copying the SQL queries that views produces be enough to get me started? Below is a view using field collections and a screenshot of the views_show_query pasted into Heidi. There are two arguments given to the view. "1422" and "1243". ... the module adds 'User ID to show final query' field in views preview form. You must enter numeric user ID in this field to view the real SQL query. In your own site where you have Forena installed, you can find this query at relative path admin/structure/forena/data/sampledb.distribution/edit. And to see the power of this query with Forena parameters, go have a look at the Users in cities in state Illinois sample, which in your own site you can find via relative path /reports/sample.user_distribution_simple?state=IL. The interesting/relevant part here is the ?state=IL at the end of it: change it to any other (valid) state like CA, FL, etc, and see what happens (answer: similar report, for the state you asked for). With that, I think your question (challenge) is reduced to finding a way to find a way to use these kinds of relative paths (with the query strings to indicate report parameter values, and use those parameters in your query parameters also. Ps: If you refine your question with more specific paths, a samples SQL, the parms you have in mind etc, I might be able to further refiine my answer about also. Not the answer you're looking for? Browse other questions tagged 7 organic-groups reporting forena or ask your own question.